The primary aim for my front suspension modification was to reduce some of the shake issues associated with the ineffective lever arm dampers. 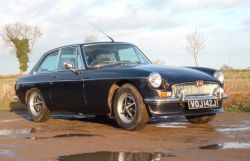 I also wanted to increase control while retaining the enjoyable handling of the MGB. My hope is that a good telescopic damper conversion will achieve both of these aims. I've retained the chrome bumper GT anti-roll bar which is quite thin. Increasing the anti-roll bar thickness would reduce the car's tendency to oversteer which is considered 'safe' but makes the car much less fun to drive. The beauty of the MGB is the controllability of the oversteer and I'm keen to retain this characteristic. Increasing the front spring stiffness would have a similar effect to a thick anti-roll bar so I've retained the original springs. The telescopic dampers should improve controllability by reducing roll rate rather than increasing roll stiffness. I prefer telescopic dampers to lever arm dampers as the damper travel in telescopic dampers is greater for a given displacement. This allows better control of damping and minimises the effects of 'stiction' which is where the damper piston stops moving during very small wheel displacements, and undamped vibration is transmitted into the car causing shake and steering nibble. 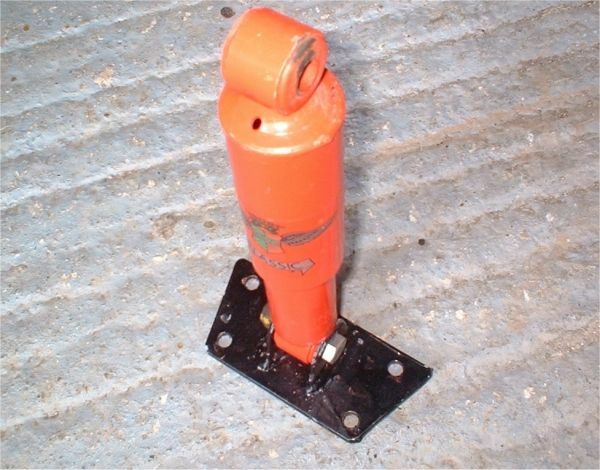 To make the damper effective for small displacements the telescopic damper must be mounted stiffly into the suspension. An ideal installation would be where no suspension movement would be possible if the damper were to be replaced by a solid bar. 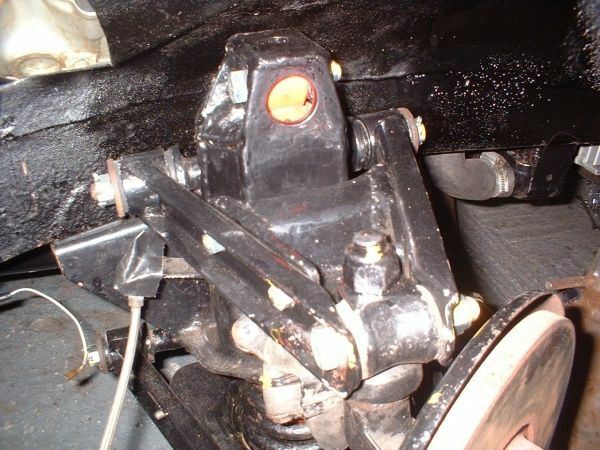 This is why I have adopted the MG RV8 approach to positioning the damper inside the spring. I rejected the bolt on conversions where the damper is mounted ahead of the suspension as suspension and bracket flex would stop the dampers from working in small displacements. I've used Koni Classic adjustable dampers. I've previously used these dampers on the rear suspension and have been happy with them. The only downside is the damper must be removed from the car for adjustment. This is easy in my installation as the damper drops out of the bottom of the spring pan with the removal of 4 bolts without dismantling the rest of the suspension. 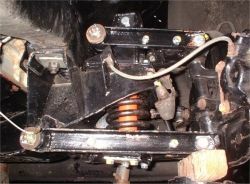 The bottom mounting is angled outboard slightly so that the damper doesn't foul the spring during suspension movement. 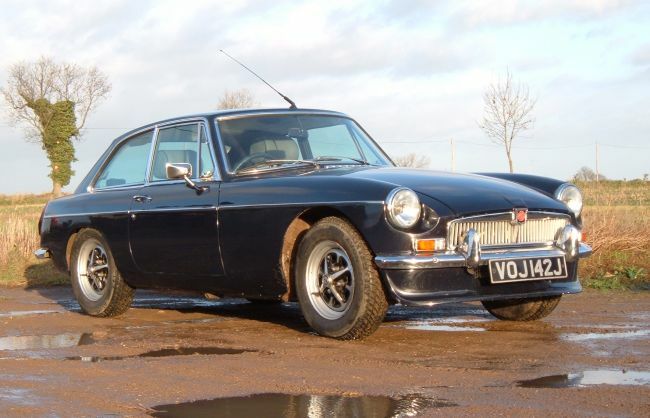 I've retained the standard MGB road springs. The damper bolts into this modified spring pan. The lower suspension arms remain otherwise standard, although if understeer is a problem I might upgrade to slightly longer ones to increase negative camber. 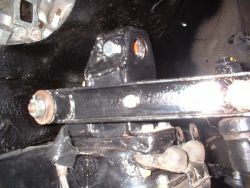 I replaced the lever arm damper with a new damper top mount and upper arm. The top mount is fabricated from 5mm steel plate which is perhaps a little thick but it is still much lighter than the lever arm damper. I used the original bolt holes on the inboard of the crossmember but had to extend the outboard holes further outboard to make room for the damper. The upper levers are made from shortened lower levers. 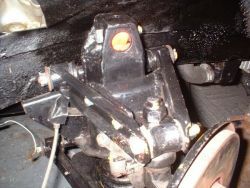 The shortening was carried out by re-bending the outboard end of the lever to accept the upper pivot mounting. The levers are attached to the damper top mount using a shortened lower lever attachment. I made a new brace between the upper levers. The brace had to be positioned low on the levers on the outboard end to act as a bump stop, and cranks up towards the rear to clear the mountings for the damper top mount. The hole in the front of the top mount is there to aid removal of the damper. I fitted a heatshield between the brake piping and the exhaust manifold as the clearance between the two is not much more than 1 inch where the solid pipe joins the flexible pipe. I also moved this connection forward by about 1 inch to increase clearance to the upper suspension arm. The brakes otherwise remain standard MGB V8 parts, although I would like to upgrade the front brakes to vented discs at some stage in the future - I'm just waiting for a good conversion to come onto the market. The front suspension ride height finished up somewhere around 25mm too high. Well it would wouldn't it - I retained the rubber bumper front crossmember. I've no idea why I didn't do anything about this during the suspension modifications, or why I sold my spare chrome bumper crossmember during the rebuild. I'm going to measure ride frequencies before I decide what to do about this. More later. The conversion worked in that I've eliminated the steering shake/nibble caused by the lever arm dampers. I need to increase the front damping a little, and sort the ride height. Also I'm not too happy with the steering - it's grand touring rather than sports. There will probably be some more changes in this area before too long. Since carrying out this conversion I have come across a conversion where the damper is mounted outboard of the spring. 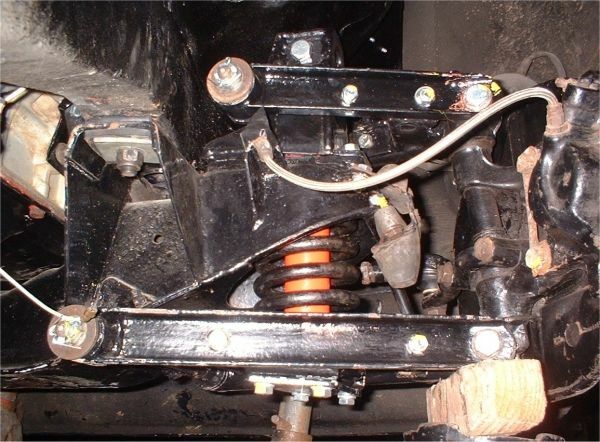 This is marketed by the MG Owners Club as an RV8 style front suspension. This would further increase damper travel relative to wheel movement which has to be a good thing. The standard bump and rebound stops have been removed to make room for the damper, so I guess these have been incorporated into the suspension in another way. 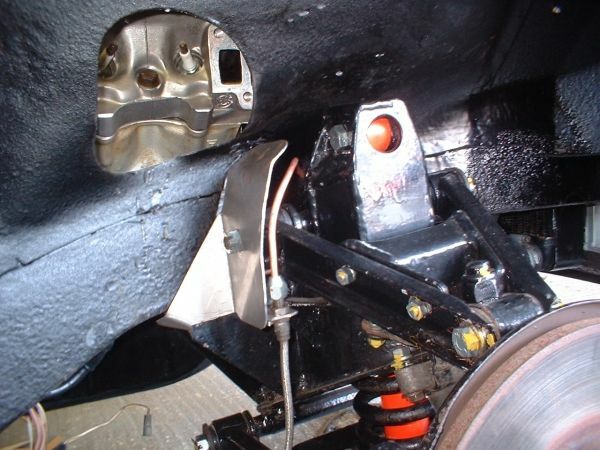 Their system also uses ball joints and has vented discs. The downside is the high cost - well over £1000. Also would you really trust these aftermarket kits? My MOSS coil over damper conversion fell apart after a few hundred miles. 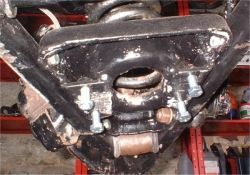 See the front suspension drawings for more detail of the conversion.